"It is what it is" - that's all the Prime Minister could wearily say on Friday when we asked him about the Ramsey Caye land deals that benefitted the family of former Deputy Prime Minster Gaspar Vega. And, tonight, there's more - cozy compensation deals for Vega family members that saw them end up with prime real estate on a private island close to san Pedro. Ignacio German Vega, Karen Vega, and Eduardo Vega, all family members of Former Lands Minister Gaspar Vega, ended up with land on Mosquito Caye, which approximately 8 and a half miles northwest of San Pedro Town. These compensation with land instead of monies from the public purse, happened when Gaspar Vega was in charge of the Ministry of Natural Resources. If you follow the document trail, it suggests that this was some error. The Ministry should have known it had no right to sell the original pre-owned parcels of land, but it did so anyway. Here in this document, it says that in May 2006, Belize Conservation Land Holdings Limited was granted 6.74 acres of land on Caye Caulker, 1 mile north of the iconic Split. Here in this document it says that in May 2007, the company Belize Conservation Land Holdings sold this piece of land on Caye Caulker to the other company Charter House Holdings. Here it says that Charter House Holdings paid 700,000 US dollars to buy the land. The documents continue the history of this piece of land, noting that Charter House Holdings entered an agreement with Aquarius Holdings Limited for this very same 6.74 acres of land. So, it's private, and the Ministry should have known this. However, in 2009, the Gaspar Vega Led Ministry sold a portions of this private land to the private citizens. In this document it says that Krystel Guzman bought lot 3 for $2,500. Here in this document, Darrel Henry bought lot 1 on Caye Caulker in 2009, from the Government of Belize. This document it says that Amy Forte bought Lot 2 from the Government for $2,500. All of these transactions happened on the same date, May 18, 2009. 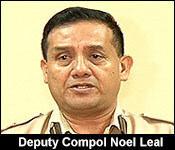 The documents then say on February 16, 2010, Krystel Guzman sold her land parcel to Ignacio German Vega and Karen Vega. She supposedly collected the very modest fee of $30,000 for land worth twenty times that. Darrel Henry sold his to Eduardo Vega, also on February 16, 2010. He supposedly collected $25,000 - again, a mer fraction of the market value. Amy Forte allegedly sold her piece of land to Andre Vega, also for $30,000, she did her transaction 1 day after Krystel Guzman and Darrel Henry. But, remember, these parcels of land are all part of that private land that Aquarius Holdings now owns. That forced a situation where the Ministry somehow felt it had to compensate them for a private transaction, and instead of paying out government funds, the Lands ministry compensated with public land to these members of the Vega family. For their bogus title, Karen and German Ignacio Vega were then given 8.167 acres of land on Mosquito Caye in November 2014. For his bogus title to the private Caye Caulker Land, Eduardo Vega was given 7.215 acres of land on Mosquito Caye in April of 2015. The leaked documents do not say what Andre Vega was compensated with for his bogus land title to that private land document. As we understand it, the story of Mosquito Caye gets interesting in 2007 when Florencio Marin Sr was lands Minister and he leased it to an individual in Corozal. As we understand it, Vega cancelled the lease and that's what put the land in play. A series of land transactions are carried out in which these private citizens develop a history of ownership. 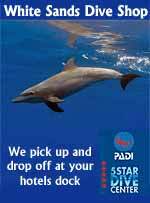 They hold on to the paper ownership for a few months, and then, they sell it to a member of the Vega family - at a very low price to attract little or no stamp duty. If the land was indeed crown land, then the Vega family gets final ownership, usually a fraction of the cost at market value. If it was pre-owned land, the Lands Department's compensation protocol is triggered where the Government is obliged to compensate the final paper owners, with money from the public purse, or they are given alternative pieces of land. In these latest transactions, civilians Krystel Guzman, Darrel Henry, and Amy Forte were allegedly sold 3 separate pieces of land on Caye Caulker, which is made up of prime real estate, worth 1.4 million dollars back in 2007. The documents say that they then sold their pieces of land to Ignacio German Vega, Karen Vega, Eduardo Vega, and Andre Vega. They supposedly collected $30,000 and $25,000 separately. 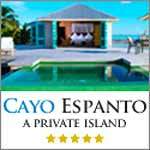 The land is privately owned, and so the Ministry of Natural Resources, headed by Gaspar Vega, compensated Ignacio German Vega, Karen Vega and Eduardo by given them several acres of island property on Mosquito Caye, off the Coast of San Pedro - very valuable properties close to Leonardo Di Caprio's Blackadore caye. 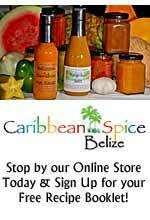 It's sweet come up, and we've since learned that Amy Forte from Belmopan didn't even know her name was used. We are told by sources that she was not even aware of the conveyance, or that the grant that was issued in her name. 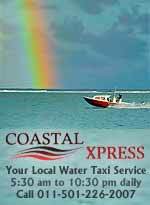 We're told that she had applied for a piece of land on Caye Caulker, and she never got the land she was seeking. It seems her application was fraudulently used and then flipped to the Vega's without her knowledge. We'll keep following this story. Former Lands minister Gaspar Vega resigned from Cabinet last October in the wake of a land scandal in which his son, Andre Vega, and well-known Belizean attorney, Sharon Pitts-Robateau were implicated in a deal which saw them acquire privately owned land through the Government for $2,500 each, before getting $400,000 in compensation from the Government for the duplication of ownership. That matter is now being pursued in the courts, as the Government has demanded the return of the money paid to those persons. 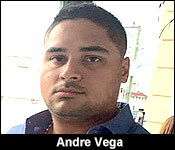 There are more revelations tonight concerning the extent of the Vega family’s grab for land across the country. Not only was there land swapping with seemingly willing accomplices, but new documentation indicates that relatives of former deputy Prime Minister and Lands Minister Gaspar Vega engaged in alleged forgery in a land scheme involving compensation for lands improperly acquired in Caye Caulker. The land in question was later flipped for public land on Mosquito Caye as “compensation” following a dispute with the prior owners. But tonight, one of the persons involved, a Belmopan resident, has asked Prime Minister and Minister of Natural Resources Dean Barrow to intervene to clear her name, denying involvement in the extensive land hustle. 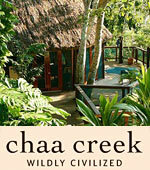 Amy Forte says she never bought any land on Caye Caulker, much less sold it to Andre Vega, Gaspar’s son. The allegation that she did sell the land, she says, is causing her grave personal and professional distress, and she wants it behind her. News Five’s Aaron Humes takes a look at the latest twist in this ongoing saga. 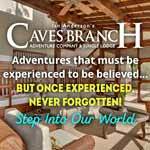 It’s one thing to have acquired hundreds of acres of valuable property across the country through good friends and acquaintances, as the Vega family did – Carmelita in Orange Walk, Ramsey Caye and Spanish Creek in the Belize District, to name a few. But tonight there are revelations that the alleged land fraud also involved forgery. 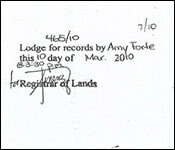 Amy Forte of Belmopan, through her attorney Deshawn Arzu Torres of McKoy Torres LLP, has written the press and Prime Minister and Minister of Natural Resources Dean Barrow, stating that her signature was forged to facilitate a transfer of land she never owned, specifically just under an acre of land on Caye Caulker, in particular the section north of the Split. The Deed of Conveyance provided to News Five purports to say that Forte got this land in May of 2009, for just two thousand five hundred dollars, and agreed with Andre Vega in February of 2010 to convey it to him for thirty thousand dollars. The document carries her signature and that of a justice of the peace, one Darlene Padron, who News Five understands is closely linked to the Vegas. Forte states clearly in the press release that she has never met Andre Vega, and applied for land on Caye Caulker around 2007 which she says she never got a response on. It follows that she could not have purchased the land in question, and that the signature on the papers is forged, since she never saw it, therefore never signed it. But the story doesn’t end there. There are other persons named who got lands on Caye Caulker and sold them on to members of the Vega family, in a familiar pattern repeated elsewhere. But this time, there was a twist. The lands were already owned by a private company and had to be given back. 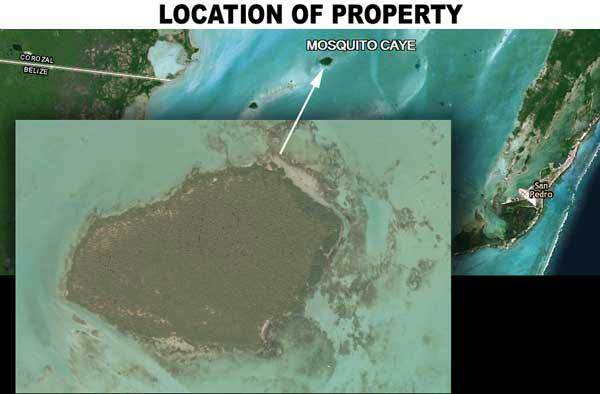 So, the Government apparently decided to compensate the Vegas with public land on Mosquito Caye, which is located approximately eight miles northwest of San Pedro Town, Ambergris Caye. Ignacio, Karen and Eduardo Vega between them received more than fifteen acres of land there, many times more than what they had sought on Caye Caulker. There is no indication of what Andre Vega’s compensation was. It was reported that in 2007, the entire Mosquito Caye was leased by then-Lands Minister Florencio Marin, Senior, to a Corozal resident, which lease was subsequently canceled by Gaspar Vega when he took office. Amy Forte says the incident in which she is named has caused her, “extreme embarrassment, loss of personal and professional reputation, emotional distress, brought into question her integrity, and threatens to jeopardize her career,” She asks the Government to cancel the Minister’s Fiat Grant of 2009 and Deed of Conveyance of 2010 and fully clear her name. 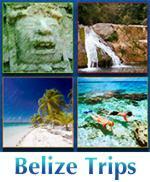 She also reserves the right to take legal action against the Vega family and the Government of Belize. Aaron Humes reporting for News Five. Attorney Deshawn Torres declined comment this evening on behalf of herself and her client, who has asked that the process be allowed to run its course before making any public statements. Tonight, there is a whole lot happening with that piece of land which Amy Forte says was fraudulently conveyed to Andre Vega with a forgery of her signature. First, her letter to the Prime Minister has prompted him to act - which is a big reversal from the position he took two weeks ago, when he famously said of the shady land deals involving the Vega's: "what it is, is what it is." Well, tonight he's telling the police that what it is, is likely a forgery and that they should investigate, IMMEDIATELY. "the Prime Minister has received a letter from Attorney Deshawn Arzu Torres on behalf of her client Amy Forte. That letter makes clear that Ms. Forte was never aware of Minister's Fiat Grant no. 175 of 2009 in her name; and that Ms. Forte did not sign any conveyance to anyone Ms. Forte and her attorney have further provided to the Prime Minister a preliminary certificate of a handwriting expert asserting that the signature purporting to be Ms. Forte's, and which appears on a Deed of Conveyance of the said land to Andre Vega, is not genuine. This is notwithstanding the fact that a JP "authenticated" Ms. Forte's signature." "In the circumstances, the Prime Minister has concluded that the charge of fraud raised by Ms. Forte is credible and must be taken extremely seriously and acted upon. The Belize Police Department has thus been asked by the OPM to conduct an immediate investigation into the matter with a view to bringing criminal charges against any person or persons responsible for forgery. In addition, the Lands Department will move to cancel both Grant no. 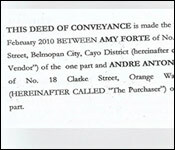 175 of 2009 and the Deed of Conveyance to Andre Vega dated 17th February 2010. As well, the Department will cancel the title for 7 acres on Mosquito Caye granted to Andre Vega as compensation for the fact that the land under Grant no 175 of 2009 was privately owned at the time of the Minister's purported Grant and subsequent transactions. Such compensation cannot stand since the Deed of Conveyance that triggered the compensation was fraudulently executed and legally invalid." The statement concludes, quote, "The Office of the Prime Minister expects that the Police investigation will be completed as quickly as possible to satisfy the need for justice in this case." So that's a big step forward; if you recall 7News was the first to do an expose on the land compensation to the Vega family last week Tuesday; we reported on the forgery on Friday, and things took on a life of their own after Amy Forte's lawyer confirmed that it was a forgery yesterday and sent a complaint to the Prime Minister. So, the critical developments so far tonight are that: 1.) the Prime Minister has ordered a police investigation, and 2.) the Lands Department has been directed to cancel both Grant no. 175 of 2009 for the Caye Caulker land and the Deed of Conveyance to Andre Vega dated 17th February 2010. 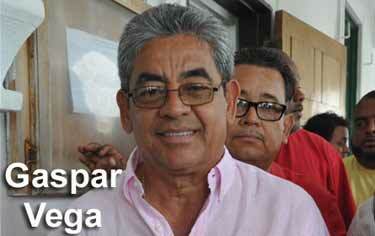 The Department will also cancel the title for 7 acres on Mosquito Caye granted to Andre Vega as compensation . But, coming late this evening, there's another major development: Andre Vega is giving it back anyway! His attorney Steve Perera sent a statement this evening saying, quote: "We are informed by our client that this purchase was done through a land agent. Our client received the original land title and executed conveyance (which to the knowledge of our client, contained the signatures of both Ms. Forte and that of the Justice of the Peace) from the Land Agent, and in exchange he provided the agent with the purchase price. Since the Deed of Conveyance contained the signature of a Justice of the Peace, our client had no reason to doubt the authenticity of the document." It continues, quote, "it turned out that the property was not available and as a result the Ministry of Natural Resources agreed to compensate our client by providing him with a substitute property located at Mosquito Caye." And here's the kicker: quote, "despite the fact that this transaction was done via a land agent our client has instructed us to inform the Government that he is prepared to relinquish the right to the poverty located at Mosquito Caye so as to prevent further issues." End quote. So, Vega seems, basically to be doing a cut and run, but it's not that simple. 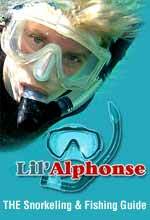 First, there is the matter of the alleged forgery, and what the letter fails to say is that he must have known something was up with buying almost an acre of beachfront property on northern Caye Caulker with a declared purchase price of thirty thousand dollars - when it was worth at least ten times that. And it also fails to say how government ended up having to compensate Andre Vega with a 7 acre piece of island property for a private transaction that didn't work out. No forgery! That's what Justice of the Peace Darlene Padron says about the Amy Forte case. Last week, it became headline news when Prime Minister Dean Barrow ordered a criminal investigation into that Caye Caulker land compensation case. That's the land flip where Gaspar Vega's son, Andre, was given prime real estate on Mosquito Caye as compensation for the paper title he had to a pre-owned piece of land that the Lands Department shouldn't have sold. The alleged middleman - or middle-woman, in this case - was Amy Forte, and as we told you, she says that her signature was forged - and that she never did any land business with Andre Vega. Well tonight, 7News has learned that there is a counter allegation against Forte, one which says that this was no forgery. 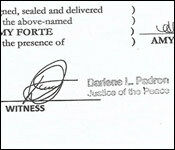 It comes from Darlene Padron, the Justice of the Peace who signed as having witnessed the transfer of that paper title from Forte to Andre Vega in this conveyance deed. Padron's attorney, Godwin Haylock, today wrote a letter on her behalf to Attorney General Michael Peyrefitte. 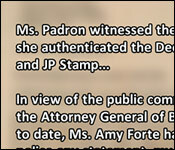 We understand that the Attorney General's Ministry, which is in charge of all JP's countrywide, had been pressing Padron for a response to the allegation that she willfully participated in a forgery of Forte's signature by authenticating the document as an official witness to the transaction. That's a serious breach of ethics with possible criminal implications for Padron, not to mention that she is at risk of being stripped of her position as a Justice of the Peace. 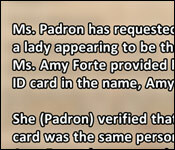 Well, in the letter from Padron's attorney to AG Peyrefitte, it reads, quote, "Ms. Padron has requested that I confirm that a lady appearing to be the likeness of Ms. Amy Forte provided her (Padron) with an ID card in the name, Amy Forte. 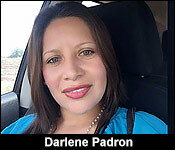 She (Padron) verified that the picture on the card was the same person in front of her. 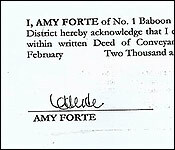 Amy Forte then proceeded to sign the Deed of Conveyance with a signature similar to that on the ID card. Ms. Padron witnessed the signature, after which, she authenticated the Deed with her signature and JP Stamp. In view of the public comments made by the Attorney General of Belize, and the fact that, to date, Ms. Amy Forte has not given the police any statement, my client seeks that your Ministry now clears her name publicly. At the appropriate time, Ms. Padron's case will be presented unhesitatingly, both in the court of public opinion, and in the court of law." End Quote. So, that's where it is now, Darlene Padron is asserting that this was not forgery, and the Amy Forte did indeed sign that document. We also understand that the Attorney General's Ministry has trying to get Amy Forte and her attorney to bring her complaint complaint of forgery before them, but, so far, they've been unsuccessful. "I have assign Assistant Superintendent of Police from the Major Crimes Unit from the day the Prime Minister informed us about the information. So far that investigation is being done at 2 levels; it is being done at the Belize City level where the complainant and her attorneys are mostly based and it is also being done from the Belmopan level in regards to the Lands Department and I must say that the investigators have gotten in touch with the attorneys and we have not been able to get a written complaint yet from the complainant, but we are expecting to do that now and as this morning when I had a briefing with the commanders just before coming here, that is what they were pursuing this morning. So hopefully we will get the complainant in and I understand she might be from out of the city or the district. The attorney has assured us that they will get her in to give us a statement. We have a lot of the documents already being put together and hopefully we will be able to complete the investigation in a relatively short time." "Are you able to say who is leading the investigation?" "It's under the supervision of Assistant Superintendent of Police Mr. Solomon Westby, who is heading the Major Crimes Unit and he is being assisted from the Belize City side by Assistant Superintendent of Police Mr. Alejandro Cowo." Up to news time when we checked with Forte's attorney, she told us that Forte had not yet made a statement. As we have mentioned, 7News has information which suggests that one of Forte's family members has been involved in land transactions. So, while Padron claims that she saw Amy Forte sign the document, Prime minister Dean Barrow has already cancelled the conveyance of the Caye Walker property property between Vega and Forte. 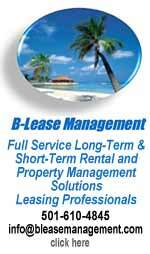 He has also cancelled the compensation deal where Andre Vega got 7 acres of land on Mosquito Caye. A release from the Prime Minister's office said, quote, "the Prime Minister has concluded that the charge of fraud raised by Ms. Forte is credible." In his own release, Vega said that he was giving the land back. A few things jump out at us: first, if Amy Forte did present herself to do a land transaction - then a photo of her ID should be in the file for the Lands transaction. Second, when Padron signed the conveyance - it must have appeared unusual that Forte was selling Andre Vega almost an acre of beachfront land on northern Caye Caulker for thirty thousand dollars - when it is worth almost ten times that.